Well it has been awhile since I have had more than 1 freebie in my mail due to my absence from hunting freebies but yesterday I had 3 freebies in my mail and my tablet arrived yesterday too that I ordered from teambuy. Click here to see my tablet post. So in my mail today I got my free poise samples, my free juice beauty samples, and my free Generation Know bracelet from U by Kotex. 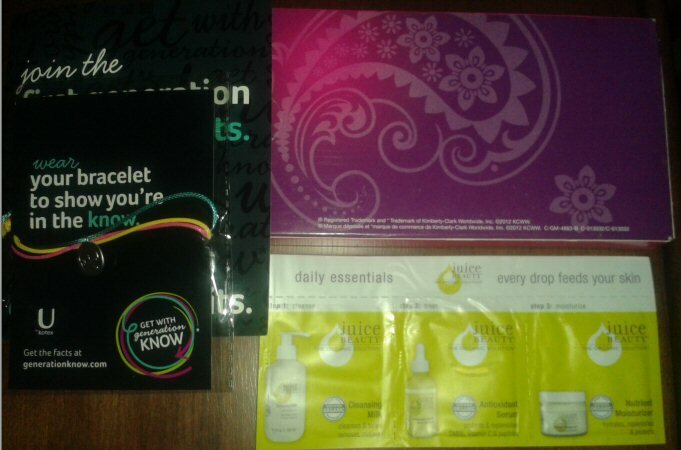 Freebies that are still available that I received are the free poise samples & the free Generation Know Bracelet. Click here to see my post on the poise samples or if you already got those but didn’t get the bracelet. Click here to see my post on the Free Generation Know Bracelet!